On January 17, 2019, Nourish innovators were joined by organizations across the country to share learnings across food projects working to enhance patient experience, organizational culture, and community wellbeing. Read more about the Virtual Retreat and join the conversation yourself at the Nourish Food for Health Symposium in Toronto May 15-16 2019. The Revised Canada Food Guide offers a powerful opportunity to look more closely at food in health care, with the potential to influence the diets of thousands of Canadians a day fed in healthcare facilities, and to model healthy eating practices that can be taken up at the household level. Nourish is hosting two events on September 5th and 6th in Montreal addressing food and health care through inspiring examples from Canada, the US, and Denmark. Please find the details below. Local and organic food procurement is the norm among hospitals, schools, and daycares in Copenhagen (Denmark), and in the United States. Join us to hear about how these public institutions managed the transition and what their principal success factors were. Through brief presentations, we will also discuss current food procurement practices in Quebec’s public institutions and what levers are necessary in order to make a similar transition. Join us to hear inspiring stories of transformative change towards nourishing and sustainable food in hospitals. Presentations will be followed by a moderated discussion. A light lunch will be served, compliments of the CHU Sainte Justine food services, featuring local organic food. Manager of Food services at CHU Sainte-Justine. Josée Lavoie is a dietician and director of food services at the CHU Sainte-Justine in Montreal, leading their prize-winning transformation to room service as well as initiatives to increase the local and organic food served. Retired Senior Physician and Head of Clinical Nutrition, Copenhagen Hospital Corporation, University of Copenhagen, Denmark. Dr. Kondrup was the founder and long-time chairman of the Danish Society of Clinical Nutrition and was an active participant in the Cophenhagen House of Food, which increased procurement of organic food from 40 to 90% in the space of a few years. Vice President, Healthcare Continuity and Support Services, Kaiser Permanente, United States. Kaiser Permanente is a US healthcare provider for over 13 million people. 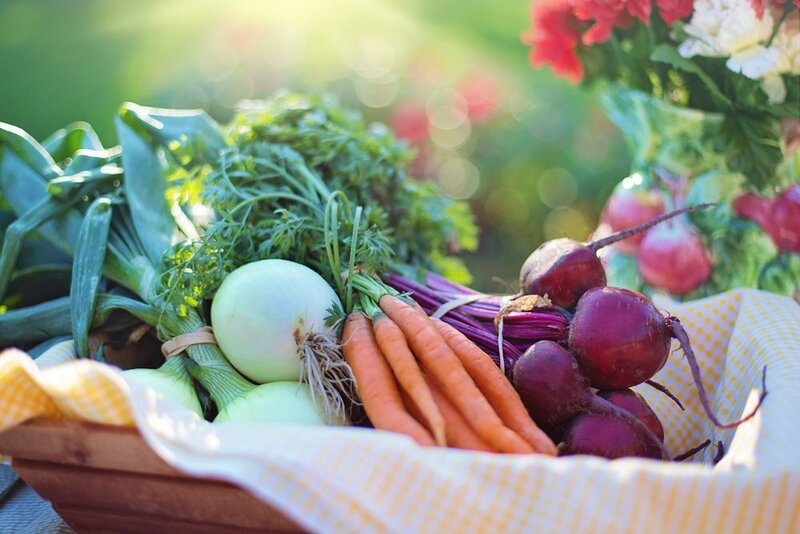 Skip Skivington has overseen much of Kaiser Permanente’s innovative work on sustainable and healthy food in hospitals, including a pledge to buy all of its food locally or from farms and producers that use sustainable practices and use antibiotics responsibly by 2025. Click here to see complete presenter biographies. Nourish invites you to an afternoon of presentations and discussions with local and international guests who will be sharing their inspiring stories of transformative change towards sustainable food in hospitals and other healthcare facilities in Canada, Denmark and United States. Two Nourish events will be hosted in Toronto on September 10, 2018 - this event and a lunchtime event at St Micheal’s Hospital. Presentations will be followed by a moderated discussion and Q&A. Light refreshments will be served. Click here to register and learn more about this event. Nourish invites you to a lunch hour of presentations and discussions with local and international guests who will be sharing their inspiring stories of transformative change towards addressing malnutrition and sustainable food in hospitals and other healthcare facilities in Canada, Denmark and United States. Two Nourish events will be hosted in Toronto on September 10, 2018 - this event and a second event later in the afternoon at MaRS Discovery District. Presentations will be followed by a moderated discussion and Q&A. This is a bring-your-own-lunch event. Light refreshments will be served. On an overcast July morning, the Nourish Toronto team drove from Toronto to Barrie to visit Grove Park Home, second home to our Nourish innovator– Travis Durham, a place where community and care come together to serve nearly 140 elderly residents. In May, the long-term care facility celebrated its 50th anniversary, and last month Travis’ Nourish work made it to the national news on CTV. We made several stops on this tour, which was filled with activities, delicious local treats and engaging conversations with both staff and residents; the highpoints being the time we spent in the on-site resident garden and at the backyard beehive with the residents, Ila and Robert. The resident food garden, an open, green courtyard in the centre of the complex has nearly two dozen raised planters and is a great example of accessible, spatial design. Seeing the garden, it is hard to imagine that this space had been unused and closed off to residents for fifteen years due to mobility hazards. Now it’s a favourite area for residents, guests, and staff. 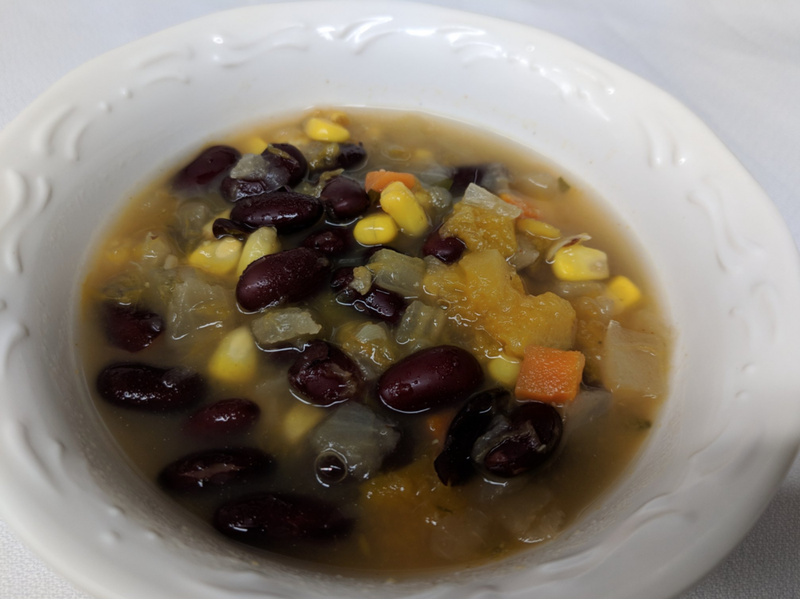 In front of us was a garden in full bloom, with rows of corn, tomatoes, ground cherries, basil, zucchini, sweet peppers, beets, rosemary and lettuce– all tended by residents. For this project, Travis partnered with Robert Patterson, a farmer, whose organization– The Growing Connection specializes in innovative horticultural systems. At Grove Home, he worked with Travis to set up the food garden, starting with a dozen Caja boxes, and last fall the resident council co-chaired by by Ila Ellison, purchased an additional two dozen boxes to scale up the initiative. Robert has brought his Caja boxes all over the world, working with communities in the North and internationally. “When the grandmothers have taken on the change, that’s when you know it is sticking. Here at Grove Park, we start with the grandmothers,” said Robert as he walked us through the motivations, mechanics and benefits of the garden program. 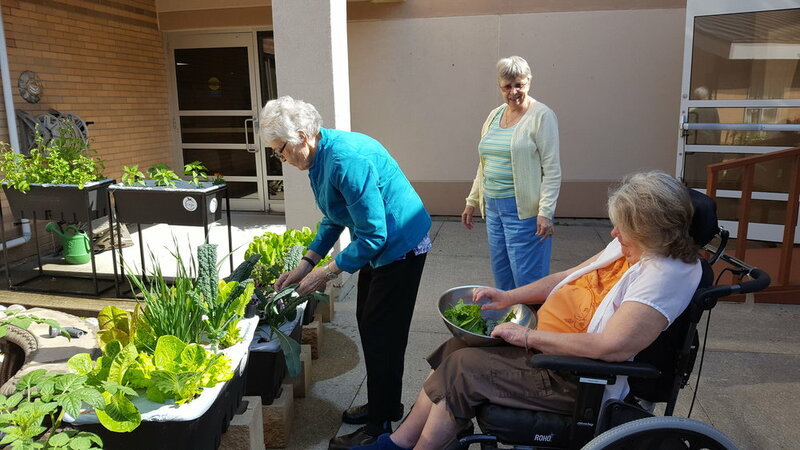 The garden (also a part of the facility’s DementiAbility program) has notably enriched the lives of the residents by creating an accessible on-site green space wherein they can connect with their surroundings and each other, and also get the freshest produce on their plates. Last year, it won the AdvantAGE Ontario Innovation Award for Seniors’ Life Enrichment. Later in the afternoon, we got to tour the backyard beehive with beekeeper, Peter Dickey of Dickey Bee Honey. 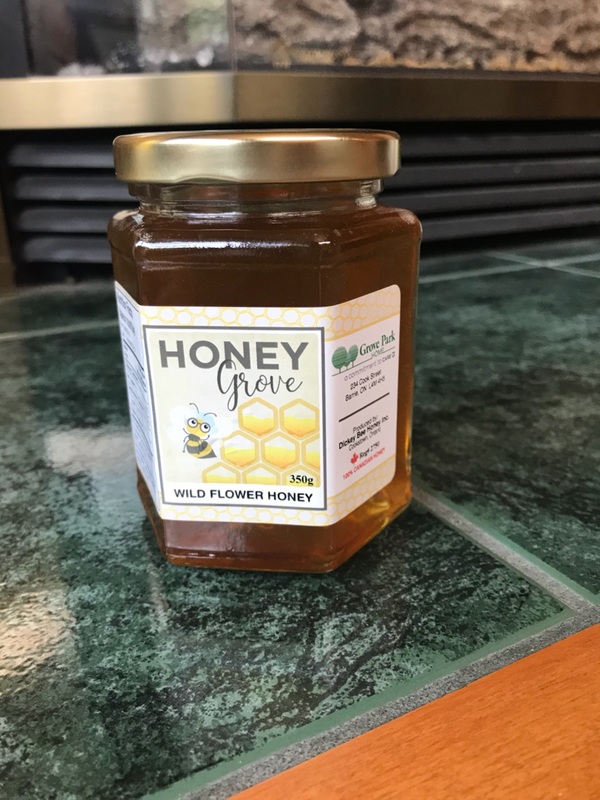 The Grove Park bee program was started last year with the goal to have resident-supported, on-site honey production. Since then, the residents bankrolled a private-label honey program through which they have sold over 350 jars of honey, bringing in profits that have already exceeded the target set for 2019. The abundance of honey harvested has also led to a shift in the residents’ food habits to the extent that honey has replaced fruit jams on toast, and is now a permanent breakfast condiment. Along with the support that Travis and the senior leadership team have lent to the project, the success of both the garden and beehive is underpinned by the involvement of the residents in the planning, management and maintenance of these projects. These ground-level breakthroughs at Grove Park Home are a great example of how engagement of senior leadership, resident-focused decision making and community partnerships can be leveraged to improve the quality of care, and consequently the quality of patient life in health care. The second Nourish cohort retreat took place in the middle of the mountains and woods on Coast Salish territory. After a long year of zoom and phone calls, the energy was high from having all 25 cohort members be physically back together for 5 days.